I will start by describing specific ecological systems that have multiple stable states, lakes and coral algal grazer systems giving models of the latter. I will then discuss approaches for predicting sudden shifts in the face of slow parameter change. The approach will depend on developing a simple stochastic model and using this model to describe the data. A key element in describing the results will be the use of receiver-operator curves. This part of the talk will include both possibilities and pitfalls. I will then discuss how the use of data can both help and be misleading in judging the efficacy of warning signals. 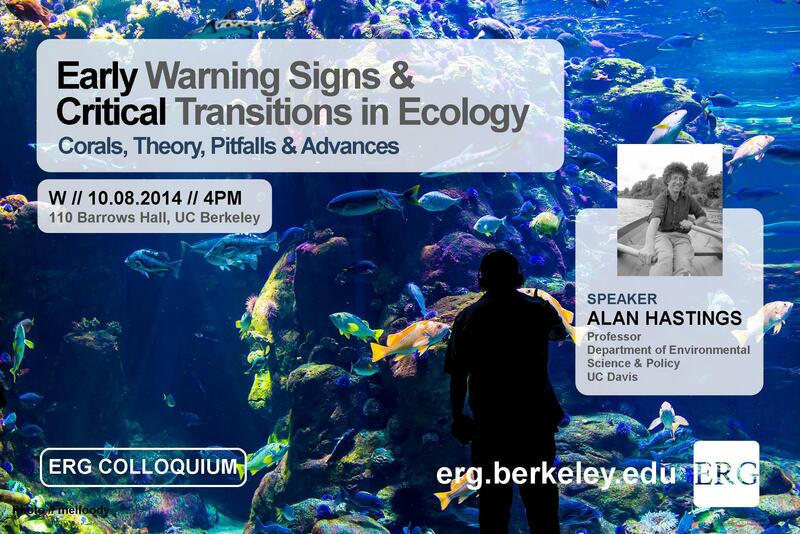 Alan Hastings is a theoretical ecologist and distinguished professor in the Department of Environmental Science and Policy at the University of California, Davis. In 2005 he became a fellow of the American Academy of Arts and Sciences and in 2006 he won the Robert H. MacArthur Award. In 2008 he founded the journal Theoretical Ecology, in which he currently holds the position of editor in chief. Formerly, he was co-editor in chief of the Journal of Mathematical Biology. His research expands through many areas in theoretical ecology including spatial ecology, biological invasions, structured populations, and model fitting.